The U.S. Department of Energy (DOE) has selected 13 projects to receive approximately $60 million in federal funding for cost-shared research and development for advanced nuclear technologies. These awards are the first under DOE’s Office of Nuclear Energy’s U.S. Industry Opportunities for Advanced Nuclear Technology Development funding opportunity announcement (FOA). Subsequent quarterly application review and selection processes will be conducted over the next five years. DOE intends to apply up to $40 million of additional FY 2018 funding to the next two quarterly award cycles for innovative proposals under this FOA. The selected awards underscore the importance of the private-public partnerships engaged in by U.S. companies in order to share expertise needed to successfully develop innovative nuclear technologies. The projects will allow industry-led teams, which include participants from federal agencies, public and private laboratories, institutions of higher education, and other domestic entities, to advance the state of U.S. commercial nuclear capability. First-of-a-Kind (FOAK) Nuclear Demonstration Readiness Project pathway, intended to address major advanced reactor design development projects or complex technology advancements for existing plants which have significant technical and licensing risk and have the potential to be deployed by the mid-to-late 2020s. Advanced Reactor Development Projects pathway, which allows a broad scope of proposed concepts and ideas that are best suited to improving the capabilities and commercialization potential of advanced reactor designs and technologies. Regulatory Assistance Grants, which provide direct support for resolving design regulatory issues, regulatory review of licensing topical reports or papers, and other efforts focused on obtaining certification and licensing approvals for advanced reactor designs and capabilities. As part of DOE’s commitment to supporting U.S. industry through private-public technical partnerships for nuclear energy innovation, the Department is also announcing technical voucher awards to U.S. companies selected under the Department’s Gateway for Accelerated Innovation in Nuclear (GAIN) initiative. Design and License Application Development for TRISO-X: A Cross-Cutting, High Assay Low Enriched Uranium Fuel Fabrication Facility – X Energy, LLC (Greenbelt, MD). This project will develop the design and license application development for a fuel fabrication facility capable of handling high-assay, low-enriched uranium and production of U.S.-developed uranium oxycarbide (UCO) TRistructural ISOtropic (TRISO) particle based fuel elements required for the future fleet of advanced reactors. Phase 1 NuScale Small Modular Reactor FOAK Nuclear Demonstration Readiness Project – NuScale Power (Corvallis, OR). This project will conduct design finalization activities and ensure supply chain readiness to meet a commercial operation date of 2026 for the first NuScale plant. Combining Multi-Scale Modeling with Microcapsule Irradiation to Expedite Advanced Fuels Deployment – General Atomics (San Diego, CA). This work proposed by General Atomics aims to combine advances made in microstructurally-informed fuel performance modeling and simulation tools with a new microcapsule irradiation capability that can substantially reduce the schedule and cost burden associated with qualifying new fuel systems for commercial deployment. Modeling and Optimization of Flow and Heat Transfer in Reactor Components for Molten Chloride Salt Fast Reactor Application – Elysium Industries USA (Clifton Park, NY). This project will develop the computational fluid dynamics models needed to simulate and optimize the flows of chloride molten salt fuel in a reactor vessel and heat exchangers for their Molten Chloride Salt Fast Reactor design. Establishment of an integrated advanced manufacturing and data science driven paradigm for advanced reactor systems – BWXT Nuclear Energy, Inc. (Lynchburg, VA). This project will develop the ability to implement Additive Materials Manufacturing to the fabrication process for nuclear components and sub-components that will yield acceptable material structure and strength that can be accepted by the national code organizations and the regulator. Dynamic Natural Convection – Passive Cooling for the LWR Fleet – NuVision Engineering Inc. (Pittsburgh, PA). This project proposes an engineered solution to mitigate the effects of loss of power to light water-based nuclear reactors and to remove decay heat from the reactor core, mitigating losses due to random equipment failures and severe accidents. Resolving the Regulatory Issues with Implementation of Online Monitoring Technologies to Extend the Calibration Intervals of Process Instruments in Nuclear Power Plants – Analysis and Measurement Services (AMS) Corporation (Knoxville, TN). This project will work with nuclear industry stakeholders and the regulator to develop guidelines for extending calibration intervals of transmitters using online monitoring technology. Pre-Application License Review of Silicon Carbide Composite Clad Uranium Carbide Fuel for Long-Life Gas-Cooled Fast Reactor Cores – General Atomics (San Diego, CA). This project will engage the regulator to execute a pre-licensing review of a silicon carbide composite-clad uranium carbide fuel system for use in a gas-cooled fast reactor long-life core. ThorCon US, Inc. in Stevenson, WA ($400,000). 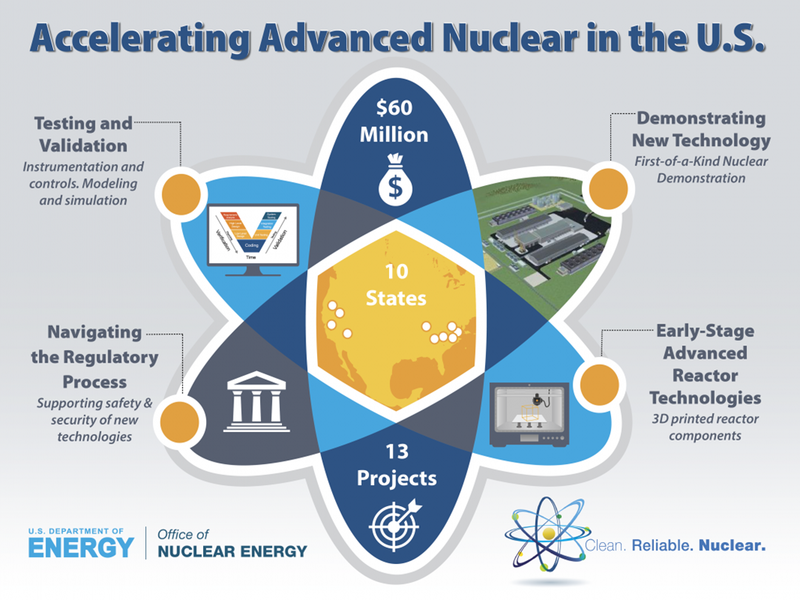 “Promoting early-stage investment in advanced nuclear power technology will support a strong, domestic, nuclear energy industry now and into the future,” said DOE Secretary Perry. More information on the Office of Nuclear Energy and its programs can be found the DOE Office of Nuclear Energy home page. US Energy Secretary Rick Perry and François Jacq, Chairman of France’s Alternative Energies and Atomic Energy Commission (CEA), this week signed two Statements of Intent (SOIs). The signing ushers in a new era of DOE-CEA research and development (R&D) cooperation with enhanced collaboration in the area of advanced fast neutron sodium-cooled nuclear reactor technologies and new collaboration in the area of artificial intelligence. The new cooperation on the development of advanced fast neutron sodium-cooled reactors will explore areas of collaboration ranging from modeling, simulation, and validation to technology testing, access to supply chain, experimental facilities, and advanced materials. No (intentional) neutron moderators (water or graphite), resulting in a “fast”(or “hard”) neutron energy spectrum compared to thermal reactors (LWRs and HTGRs). Improved neutron economy due to larger fission-to-capture cross section ratio and greater number of neutrons per fission at high-energies. Fast neutron spectrum can also be used for breeding or transmutation of transuranic waste products. Higher enrichment is required to achieve criticality (in comparison to thermal reactors). High core outlet temperatures allow greater thermal efficiency (-40%) for energy conversion; the fast reactors also have a high core power density (~5x compared to a LWR) and the potential for a long core life. The SFR uses liquid sodium as the reactor coolant, allowing high power density with low coolant volume fraction and operation at low pressure. While the oxygen-free environment prevents corrosion, sodium reacts chemically with air and water and requires a sealed coolant system. DOE and CEA cooperate on a wide range of technology areas, including the fields of civil-nuclear energy, basic science, environmental management, renewable energy, and energy management systems. Such cooperation plays a key role in maintaining cost-competitiveness and reliability across the energy mix, benefiting both countries in the enhancement of transatlantic energy security. Amid the increasing digitization of utilities, data collection devices, and smart home products intended to increase efficiency on the consumer end, cybersecurity has been an area of rapidly growing focus in the industry. The CEBN is circulating a letter to support robust funding for critical RD&D programs in DOE for the FY2020 Appropriations Cycle. These programs have demonstrated a successful track record of helping to bring transformational clean energy..